The Expert SEO Content Writer Course Is Re-open & Taking Enrollments! I’m super excited to share the news that my intensive SEO writing course, The Expert SEO Content Writer, is officially open as of today, December 21, 2018, with a special Christmas offer! After talking to and listening to my beta students, I did some curriculum tweaks and added a new lesson to answer one more big, burning question. Today, I’m uber-101%-confident in offering my SEO writing course as an evergreen training course to the public. Today’s blog about the relaunch is a FAQ of sorts. Inside, you’ll be able to pick my brain on the course reopening. Plus, a sneak peek at the current Christmas offer where I’m giving away a few special gifts to Christmas & New Year enrollees, the story of beta launch, what’s changed for today’s evergreen re-opening, why I don’t do open/close launches, who’s a good fit vs. not a good fit for the course, and more. Ready? This subject I’m teaching in my new course — SEO writing — is one of my favorite subjects. I’ve practiced the art of writing search engine optimized copy ever since 2011, when I was a fledgling, brand-new freelance writer. Here’s the thing: I’ve always loved to write. SEO writing, however, was a disciplined skill that I had to teach myself. And I learned a lot of what works the hard way — by trying, testing, failing, trying and testing again to finally learn how to create SEO content that has ranked for over 18,000 keywords organically in Google and shot expresswriters.com to the top of search. See the story behind our rankings here. Current rankings for our site: 18,400+ keywords in Google. 100% organic SEO content. This August of 2018 when I got the “lightbulb moment” to create my SEO writing course, it was a no-brainer. I worked hard to build an intensive but short curriculum, designed for busy professionals who only have a week or less to spare to devote to SEO writing skills and training. This blog post contains the full story of how I built The Expert SEO Content Writer Course from scratch. After launching the finished course curriculum for a beta run in September, we had 101 students total enroll during my 10-day open period. By mid-November, many of my beta students had successfully gotten through the curriculum. I heard happy things from so many beta students. Did you see the student testimonials we added to the relaunched SEO writing course home page? Holy success stories, Batman! While I appreciate each and every one of my beta students, I think one of my favorite stories comes from graduate student Monique. SEO content works, and she has hit the ROI jackpot! It makes my day to hear success stories like this. You’re a busy bee. It’s designed as a fast-paced, intensive, one-week program. It’s been built by someone who commonly wears five hats (CEO, content marketer, author, mommy, wife) on any given day, who can relate to your busy schedule! Structured for busy entrepreneurs, freelancers, and agency staff. You’ll be able to get through it easily inside a week or less. If you have no interest in learning SEO writing (at all), stop right now. Don’t take this course. The best students are invested students. And real investment comes first of all from passion for and interest in the subject. My initiative-takers, my most successful students, are those that enjoy online writing. I thought I’d wrap up today’s announcement by sharing a few of my thoughts here. It may be going against the grain a bit, although there are many other evergreen course creators out there, but I don’t do open and closed launches outside of beta launches. I do hold open and closed beta launches to ensure I have a successful product (over 100 students have tested this course and said it is amazing!). But in the long run, I build evergreen offerings. To put it simply, I believe that evergreen products serve market needs best. If you know me by now, you also know I’m not just about getting more sales. I’m about adding real value that complements a real need. And our customers’ journeys. Why close a service if it adds a long-term solution to a market need, and if I’ve tested it and made 101% sure that it’s a product or service that will truly solve the end user’s need? And here’s one more note on this point. Even though I launch evergreen offerings, I’m not (at all) a launch-it-and-forget-about-it entrepreneur. I refine and improve every single service and product I’ve created, as time goes on. I listen to the feedback of my users, my customers, and we re-engineer if needed to meet their needs. This is also how I’ve successfully ran and operated Express Writers. We never “close and re-open” our writing services. Ever since I opened Express Writers in 2011 and hustled for my first clients, our sales and client lists have been growing yearly from consistent progress in the industry, refining our services, and growing and improving our systems. Each year gets better and bigger. I believe if I’d been doing closed launches, we’d never be near the growth we have today going into our eighth year of business. I believe in evergreen services and products all the way…with consistent refinement, growth and tuning along the way! Just to give you a quick view at the relaunch Christmas giveaway we’re doing, here’s the offer I’m giving away with the course (total value over $690). You get ALL of this when you enroll today for $279. The Expert SEO Content Writer Course: A Complete Course in Content in Just One Week. Freelancer, solopreneur, agency — you’re a busy person. That’s why I’ve distilled 7+ years of proven content writing strategies into a step-by-step system that will have you outpacing the competition on Google in just one week— no fluff, no filler. The Only Industry Certification as an Expert SEO Content Writer. Our course is for professionals who are serious about their content careers. If you want to learn strategic copywriting techniques, advanced tools for high-ranking content, and the step-by-step formula for content success, this is for you. With the Expert SEO Content Writer Course, you’ll be able to earn official certification after you finish the course and show off your skills as a qualified SEO writer. Exclusive Student Group to Get Coaching and Questions Answered. We know that networking and bouncing ideas off peers is critical to growth and success. The Expert SEO Content Writer Course has a private Facebook student community so you can connect with over myself and more than 75 like-minded peers for support, coaching, and encouragement. May Your Holidays Be Merry and Bright…And Your SEO Content Right! Imagine what you could do with powerful SEO content? For us, we’ve seen sales from brand new leads at $5,000+. These leads found us through ONE optimized blog post. SEO content is a powerful tool to boost your brand online. If you wear a lot of hats, and “online writing” is one of them — or if you want to give your office the gift of profitable SEO writing skills this holiday, this course is perfect for you. September 24, 2018 /21 Comments/in News /by John G.
This is a guest blog by John G., Authority Writer and Content Strategist at Express Writers. Most people understand that successful content marketing requires high-quality content. Without this essential ingredient, your “marketing” won’t move the needle one bit. Unfortunately, many marketers stop at creating high-quality content. They hit “publish” and move on to the next project. At Express Writers, we are constantly updating our published content because we know that keeping it relevant and competitive is just as important as creating it in the first place. That’s why we’ve recently begun doing the same thing for clients with our new Content Maintenance Strategy service, which ensures their content never goes stale. Check out our new Content Strategy Maintenance service here (click the Options to see it). Subscribe to a monthly fee (no contract, cancel anytime) to have our Content Strategist set up ongoing tracking and keyword research every month, and check in on your rankings. We’ll build a report, look at your keywords, and discuss how you can improve your content strategy. Our new service includes a short call every month to discuss potential SEO and content opportunities with our lead Content Strategist, and we’ll use SEMrush to build and track monthly reports on your content rankings. Cancel anytime: we’ll send you a bill every month at the same time to order. The second option is our new service, Content Strategy Maintenance. You might be asking, why should I care about maintaining my content? While there’s no substitute for well-written content about relevant topics that helps readers take action toward achieving their goals, maintaining that content has become just as important. Here are six reasons why you must regularly review your content with an eye for how it can be improved if you want to see a consistent ROI. Successful content isn’t just about attracting people to your site. It should also start them on the path toward becoming actual customers. Once your content begins delivering those leads, you’ll gain helpful insights from many of them about how your content could be improved. Look at the questions you receive most often. Think about the pain points you constantly need to overcome. This is easy to do if you have on-site chat or if you get contact forms. Do you have popular posts where you can address these? That will make it much easier to convert more leads without doing more work. Google only wants to show its users search results for content that is fresh and relevant. If your post contains advice that has become outdated or fails to reflect new information on the topic, Google knows users will quickly look elsewhere for help. Google’s fondness for freshness goes back almost a decade, yet the vast majority of companies still misinterpret this requirement to mean that they must regularly produce completely new content. While new posts deserve a spot in your strategy, updating old ones is usually the more cost-effective way of keeping Google happy. The joy I felt the first time I put a client’s site on the first page of Google was eventually overtaken by a sense of dread when, months later, their main competitor joined us. It felt like in the movies, when the captain of a ship looks through his telescope to see a pirate flag coming over the horizon. On the high seas of SEO, there are going to be times when enemy ships begin catching up with you. That’s when you should immediately update your content to create a comfortable amount of distance. Aside from the obvious benefits of doing this, feel free to take some pleasure in the fact that your competitor has clearly spent a lot of time and money creating content to close the gap and, now, because of your vigilance, all of that effort will not go to waste. “Domain authority” remains a controversial topic, but it does seem as though Google “trusts” established sites more than new ones and, thus, makes it easier for those trustworthy sites to rank for high-traffic keywords. That’s why, over time, you can get more ambitious about the keywords you target. When beginners start with content marketing, one of the biggest rookie mistakes they make is to go after keywords that see massive amounts of traffic but also attract lots of competition. At the beginning, ranking for those competitive keywords just isn’t possible. However, as your rankings begin to climb for less-competitive keywords, it makes sense to look at those that were previously out-of-reach. That’s because you’ve built a certain amount of “trust” with Google and now have more opportunities to rank. Don’t stick with the same set of keywords you originally identified. Ongoing research will show you when it’s possible to post content aimed at greater and/or more qualified traffic. In my experience, the most overlooked opportunity to improve your SEO is with internal linking. Literally, all you have to do is include a link from one of your pages to another. It couldn’t be easier to do, yet it will help increase exposure across your entire site. Better still, if you have a post on the first SERP of Google, it’s also an effortless way to pass along some of that “link juice” to other pages. When I look over a client’s content and see that one of their posts is performing well, I immediately think about how I can leverage that achievement further. Either way, I’m taking full advantage of one page’s SEO success to help rank another for my client while simultaneously making it easier for their current leads to find new content. Everyone loves the idea of a quick win – a blog that, upon publishing, hits Google’s first page right away. While that certainly can happen – especially after you build up that aforementioned “trust” – successful content marketing requires a long-term perspective. Part of this means regularly checking back on your efforts to see where greater opportunities now lie and where you need to do some work to improve past posts. Creating high-quality content will always be the cornerstone of a successful content marketing campaign. However, it’s just as important that you maximize your ROI from each piece by maintaining it, as well. Otherwise, at best, you’ll see limited success before it’s back to the drawing board to create more content, which will only have the same short-term result. At Express Writers, we’ve created a new service – Content Strategy Maintenance – to ensure our clients receive the most from each post without having to take the time every month to go over everything themselves. Instead, our content strategists will review your strategy and identify which posts need to be updated and where new keyword — and topic — opportunities exist. By doing so, you’ll know that your entire content marketing strategy is continuously improving and adding value to your company. Check out our pricing for content strategy maintenance, or send us an email about your needs. Have you ever experienced one of those once-in-a-lifetime lightbulb moments? You know, the moments you never forget about — ever? The ones that end up changing your life in incredible ways? I can trace every big step in my life, from the launch of Express Writers to the idea for my first book, back to those flashes of inspiration. Keep reading for the story. I vividly remember the day, time, and place that particular lightbulb lit up. Early one day this August, I was sitting at my desk. It was a typical August day in Austin — HOT. The sun was blazing. It was one of those Texas summer days where if it was any hotter, I might as well go and sit on the surface of the sun. Grateful to be inside an air-conditioned space, I was reviewing a new writer’s sample piece, reading through it carefully. Then, it hit me. This is probably the 11,000th writing sample that has passed through my hands. It’s true. Thinking back, I realized that I’ve been assessing, interviewing, and hiring writers since 2011, when I started Express Writers. And then another flash hit me. These are the same issues, again. I see them all the time. I was in the middle of typing a note to the writer and passing her to the next phase of our interviewing process when I realized that what I was sharing with this writer was the EXACT SAME THING I’d told the last four candidates. These issues are a training checklist. I know how to fix them! …Why don’t I create a course on this? And, the entire idea for The Expert SEO Content Writer course was born. This is the same pathway behind my first course, The Content Strategy & Marketing Course. The entire idea for that course was born after a client asked me to come down to their office and teach them content strategy and marketing techniques. I’ll be honest: I usually don’t just come up with “ways to sell my knowledge,” even though I’ve had people offer in the past to pay me money if I would consult with them. To be honest, I don’t have the time — between running a biz, writing books, launching training courses — not to mention running after a toddler at home. Sidenote: I think this is a fantastic way to build a course. Don’t go out and search for a money-making course idea. Instead, let it come to you as you work and gain cred and a place in the industry. This way, it’s much easier when it comes to the selling part, too. The first big reason I think there is a serious need for this course lies in the actual pain points I heard of, real-time, from people in my audience. After I had the idea to build my course, I used Google Forms to create a survey, which I kept open for a few days. More than 50 people that were in my target audience filled out the form, and the survey results were conclusive: people needed and wanted this training from me. They told me so clearly in the survey where they took the time to share a huge amount of pain points. Once I had my survey results, I took to my office whiteboard and created a graph of my survey takers’ responses to look for commonalities and create a course outline. The second reason can be found directly inside of SEO content writing itself, which I’ve been practicing for seven years now. To be perfectly honest… you can’t just read a blog and walk away thinking you know how to do it if you’ve had no real prior experience. You need training, practice, and a guiding hand, if SEO content writing still feels like new or uncertain territory and you want to get to a “knowledgeable” level sooner rather than later. A mentor who’s been there, done that can help you get there a lot faster. I’ve spent the past 7 years perfecting the art of crafting content that wins rankings, traffic, clicks, and subscribers. We’ve built our Express Writers presence to more than 1,000 blogs, and 16,000+ SEO rankings in Google after seven years of consistent SEO content creation. Our site is bringing in upwards of 2,000-2,800 visitors/day on average — 100% organically — without paid ads. And our subscriber list grows by 5-10 people on average per day simply through the “upgrades” and correctly pivoted lead magnets I’ve created and attached to our high-ranking content. We’ve been able to achieve this kind of SEO content success for many of our clients, too. That’s exactly the kind of knowledge you should have after effective SEO content training. And that’s what I want to leave my students with in my coming course. A lasting knowledge of SEO writing that will empower them to create content that reaches and builds a community through one of the most powerful routes possible — organic rankings in Google. SEO content is more powerful than ever — and it’s poised to continue to dominate ranking methods for the forseeable future. Now is the time for well-trained SEO content writers to succeed. The Expert SEO Content Writer Course Opens Up Soon for Beta Enrollment! We’re about to open enrollment to my ​NEW​ writing course, The Expert SEO Content Writer Course​! The Expert SEO Content Writer Course site just went live, today. Read all the details about my new writing course here. The Expert SEO Content Writer Course Site Launches Today! Now that the site for our new writing course is live, here’s a sneak peek at what’s on the itinerary! This month, we’ll open the course for an official launch. I will be offering one-time special pricing for beta students. We’ll only have this offer open for a short time so this first lucky class of beta students can successfully get through the training and curriculum! I will be working with them personally in the private student community attached to the course. This is your special opportunity to get advance access to the course during this short window of time. Taught by me, Julia McCoy, founder of Express Writers, with a few appearances from special guests including content marketers from publications like CoSchedule, this course teaches you every step involved in how to write successful, profitable SEO content. At the end, you’ll earn certification as an Expert SEO Content Writer after absorbing the course knowledge and training. Let me be clear. This isn’t one of those programs that that claim to teach you SEO writing then offer you a badge after you read a few lessons. Although the course is structured for busy people and is under 5 hours of total lesson content, it will take at least a full week to complete the curriculum and soak in the writing templates, live writing coaching demos, and the recommended software. We’ve set up the curriculum so you don’t need access to paid programs (free trials are sufficient!) AND we’re even cooking up special money-saving offers for our students when the course opens. We want every graduated student of the Expert SEO Content Writer Course to ​truly be an expert ​at the art of great SEO writing. If you want to be on that list, now is your moment! This is the only time your special, beta-student, one-time price will be available and we’re only accepting a limited number of beta students. We’re keeping enrollment numbers down on this launch so I can focus on working with our beta students closely. If you’re ready to step up and be in the first class of this groundbreaking new SEO writing course, getting both a lower price AND personal attention, go here to sign up, and then just watch your in-box. I’ll be sending you more information in the days and weeks ahead. April 2018 Content Shop Update: Our Expert Copywriting Level Just Got Better! As most of our clients already know, we’re constantly updating and maintaining our services, team, and processes here at Express Writers. Quality is first and foremost at our heart. One reason I haven’t sought an outside partner or funding source is that running the company 100% by ourselves allows us to make fast, agile changes to our processes. These processes can instantly allow our clients to experience more customized, high-quality services–and turn on a dime to change or fix any issues, if they come up. Our personal commitment and involvement at this level is one major reason why we don’t even consider ourselves a competitor against many other “content vendors,” like Textbroker and WriterAccess, to name a few. You want cheap content on a budget? We’ll hold the door open for you, and recommend one of those vendors. You want quality web content for your blog, website or your clients’ sites? That’s when you come to us. As the CEO, I haven’t earned my place in the top 30 content marketers worldwide by chance or through cutting corners. Quite the opposite. It’s been a long, grueling journey, full of learning experiences and challenges. I learned and grew, as I wrote and published two bestselling books in my industry, led my company, and built/rebuilt our processes. This April, we’ve made some changes in our Content Shop that we want you to be aware of. What’s at heart? You guessed it–quality. We want to continue to serve our clients with the best content (not the cheapest). Continue reading for a short memo on our internal, and external, changes. Here’s a rundown of the major changes we’ve gone through this year. There are more–we literally improve our processes daily–but these are the biggest ones. As of March 2018, we completely removed the public link to our General product level from the Content Shop. For every client interested in this level, our support team can personally hand them the link to this service after verifying that general level will be a fit for them (most sites need expert content at a minimum to see ROI from the content produced). Just open the chat in the right-hand corner of our site, or drop an email to request our General level. Our team has grown in the last month! By now, we have a library of more than 70 expert writers that have individualized experience in a wide range of industries. This is an increase of more than double in our team size across the past four months. And this week, we revamped how we offer Expert content. 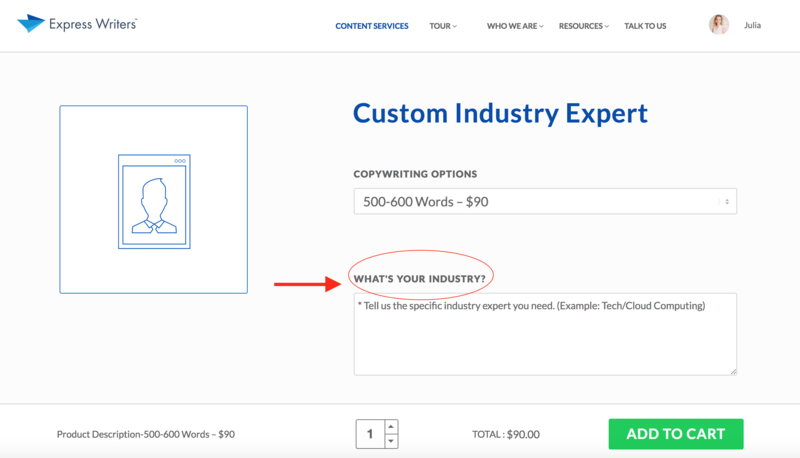 This single product now features a box where you, our client, can type in your EXACT industry or topic/niche, and we’ll match you up to that expert! You’ll see the Expert Category in our Content Shop has drastically reduced to lesser “items” – but with the ability to tell us your specific industry before you place an order, we’re able to focus on customizing our content solutions for your needs more than ever. As our team grows, and we add more support specialists, this will be a fantastic way we can continue to focus on your specific topic and make sure it goes to the perfect-fit expert in our team. One of the main cores I had at heart when I launched Express Writers, was hiring every writer personally. I wanted to find the best writers. Today, seven years later, I still continue to hand-pick every writer. This year, we’ve refined that process. I continue to carefully vet and look for industry expertise that can match every one of our client’s industries and topic areas. Our new step added to this process is having our Content Director, Hannah, hold a phone interview call with every writer that allows us to get to know our writers on a personal level, and find out their interests and favorite topics to write about, too. We also keep a running database about every topic under the sun that our experts have real-life experience in. These changes have already improved how writers work within our team, and boosted client satisfaction rates. Need content that pushes your brand forward online? We’re your team. Talk to us today. This year, I finally made it to SXSW. I live 25 minutes away from the event, and it’s always been a wish of mine to make it there. The interactive ticket isn’t cheap at over $1,000, so that held me back for a while. This year, I decided to go all in and do it. I’ve been warned by many locals that the event is a total madhouse, and I was worried. Luckily, my experience was mostly pleasant. I attended brand marketing sessions only, none of the music festivals, so I can’t speak for those crowds: but the marketing, startup and brand sessions were extremely smooth and easy to attend. Registration and session lines at SXSW are run well. Yes, crowds and crowds of people start gathering in-between events, but the lines move fast. I was pleasantly surprised by this. When I was at a session in the Austin Convention Center, SXSW volunteers held up big signs with the session name that showed you where the line started. The line ended up going down three hallways with hundreds of people single-file, which looked daunting. But the minute the doors opened, there was more than enough room to hold everyone, and we all got seated easily. Registration day at SXSW. It was a breeze to get in and pick up my badge. Absolutely, definitely, use the SXSW map they give you at registration. Really – study the map and let it guide you. Once you know where the buildings are, and most of them are blocks away from each other, things get really easy. I walked to the Dell Experience, tiny house of smart, and a session inside the Convention Center all within two hours after studying the map and knowing which direction to walk in once I left each building. It was super easy and simple to get in to each of the separate events. SXSW traffic really IS terrible. Use Lyft. I took Lyft both ways, from home to the event, and got around easily that way. With the app, I could literally request a driver sitting at the curb I was walking down. Downtown, you’ll end up crawling from block to block if you drive. Not just because of the surge of 90,000 extra people in Austin, but also because many roads get blocked off. If you’re just going from session to session, it’s far easier to walk than drive. Okay, now that we’re past how I learned to actually navigate and get around at SXSW, let’s move on to the good stuff: three sessions I attended and some major takeaways. Ready? Let’s dive in to the sessions I attended and what I learned from them. Kristina Halvorson is a world-leading expert on content strategy, founder at Brain Traffic, and author of Content Strategy for the Web. (I have a dog-eared copy of her book.) She was ridiculously funny and down-to-earth in the presentation she gave at SXSW. I seriously loved attending her session. And I got to meet her afterwards! Here were some of my favorite takeaways from her presentation, The Truth About Content: Broken Dreams and the Big Fix. “Content strategy is not 1,400 articles dumped on the floor of your site.” She literally showed hundreds of toys dumped on the floor in a pile for the slide representing this tatement (My Little Pony toys, specifically – Kristina’s a huge fun of MLP). I loved this reference, because just sometimes, I’ve come across a client or two that thought this was the right strategy. FYI. It’s not. “Nobody cares about your content because you didn’t ask them what they cared about in the first place.” ???? “Blend the editorial side and experience. You can’t have one without the other.” Great content is nothing without great usability. These two really do go hand-in-hand. 1. Reset. Example: Coca Cola went from a lifestyle publication and got clear on being a publication for a drink. Their website now makes SENSE! They actually dis-invested in content marketing and simplified. What can you simplify for your end user? 2. Get aligned. Many businesses only know TACTICS. Know your vision, mission, goal, objectives, etc. The RACI chart can help. 3. Actually know your audience. Pay attention to them. Exceed their expectations. Many times they don’t want to be challenged. They want to find the coupon on the site. (GREAT point.) It’s not just in SEO Research. You should be talking to your audience. Do website polls. Phone interviews. Get your support team involved in knowing your audience. Don’t just know their name and age, know their needs. 4. Establish common systems and standards. Content structure must have a taxonomy. A governance plan. 5. Beware the silver bullet. Silver bullet = AI. But guess what? Your tech did not fix the content mess and lack of strategy. The AI prediction does not cover this. “AI can mine and repurpose the best stuff.” An actual human will fix it, not AI. AI is coming, and it requires three things: 1) a reliable source of data and content. 2) accurate info suited to the application: know what you’re using it for and your end goals. 3) a framework for organizing. We’re not even there yet as website owners running a clean website. Content first? No, humans first. Another session of note that I attended was a panel with ladies from Slack, IBM, and Visa. Visa on creating content that stands out: Visa used the characters and storyline from Stranger Things to incorporate a story that stuck. Give people a path for more information. Get deeper, provide better content. Slack on creating content that stands out: Clearer, concise and human is Slack’s current motto for developing content. They want their content to read like a colleague showing you how to do something. Internal vs. external content: Slack has a few channels where they introduce new people – a “yay!” channel, which is a channel to celebrate birthdays and anniversaries. They also keep a “kudos” channel, where teammates thank other employee for being helpful. This becomes external content easily. Internal vs external content isn’t something that’s been truly defined at IBM. Purposefully internal becomes external. They’re very careful about rights in photography, messaging and video. IBM has a Chief Privacy Officer now. They are very sensitive about using others’ data. The panel was asked, Is practical content a high priority? For Slack, creating content that teaches users their app is critical. At the same time, they balance reader-friendly content. Their Work in Progress Podcast has little to do with Slack. It’s about empowering people in the workforce. Slack has to be curious about how people do their work daily. They do a series on friendship at work. “Learning how human relationships work is just as important to us as creating practical user guides.” Love that point. In the Monday session I attended, Alex said several statements about business that I had to write down. I’m going to apply these to my HR department. I didn’t take a ton of notes from this session, but the quotes I did write down are worth their weight in gold. Sometimes, one sentence can be worth a thousand words. When asked, “How do you hire good people?”, here’s what Alex said. It’s not about a big resume. It’s how driven they are. How to choose clients to work with: A quick yes or no is far better than a slow maybe. “Less than 5% of major league baseball players have college degrees. It’s not just about education. It’s about hard work. There is no shortcut in business. I had to work just as hard in business as in my baseball career. I enjoyed my time at SXSW 2018! Another highlight was that along with the sessions I attended, I met up with Mark Schaefer, who is an amazing marketer (one of the top five in the world) and author of my foreword to Practical Content Strategy & Marketing. Mark invited me to breakfast along with the Director of Marketing at UPMC, and the conversation I listened in to was amazing! Mark is strategizing his next book, which will make some waves in the industry. I can’t wait for that book. Between the people I met up with, conversations I was a part of, cool tech I saw, and sessions I attended, I definitely recommend SXSW. It’s a forward-thinking event where you get a glimpse at the future of innovation. Enjoying the “red carpet” at SXSW! I would recommend considering it if you want to meet up with a lot of marketers, brands, see some cool innovative tech (check out all the interactive houses and displays – seriously amazing stuff), and if you want to be an ear and listen in to some amazing speakers and sessions. Grammar nerds, hold onto your hats. On March 23 of this year, Carol Fisher Saller, editor of The Chicago Manual of Style’s online Q&A section, gave a presentation about some of the updates that would appear in the Chicago Manual’s 17th edition, due out in September of this year. email will lose its hyphen. Take that Kim Kardashian. Who broke the Internet internet now? If those two changes weren’t large enough for you, Saller also announced that the manual will begin accepting a singular “they” and that the 17th edition will include citation recommendations for social media posts, like Facebook and Twitter updates. Each year, editors announce the changes to the Stylebook at the American Copy Editor’s Society annual meeting. This meeting is where the world heard, in 2011, that the Associated Press intended to stop using a hyphen in email. In 2016, the Associated Press announced that it would remove the capitalization from the word internet. The Chicago Manual of Style has since announced its intention to adopt these styles. Her, his. Before, AP style required writers to use he when a gender was unknown. Today, it’s acceptable to use they, them, or their. Singular they. One of the largest changes, the AP Stylebook has recently begun to accept the use of they as a singular pronoun. This is especially useful in places where his or her would be overly clumsy or confusing. The only exception is when the phrasing would suggest there is more than one person. Autonomous vehicles. Thanks to the rise of autonomous technology, the AP Stylebook has taken up a guide for how to refer to them. Instead of using the word driverless, however, the correct method is to use the term self-driving, unless the vehicle can only do some of the driving, in which case it should be called semi-autonomous. Fact checks, fake news. “Fake news” may well be the term of 2017! Because there’s been such a sharp uptick in the use of these terms, the AP Stylebook now recommends using fake news in quotation marks to refer to deliberate falsehoods. The Stylebook also recommends not labeling individual news items as fake news that are disputed. Obvious enough, right? Flyer, flier. Thanks to the new AP changes, you’re now a frequent flyer rather than a frequent flier. This change is due in large part to the fact that flyer is more common in both American and British spelling. The Oxford comma. Today, clarity is more important than anything else, especially when viewed from the AP Stylebook’s standpoint. While the standard style has generally been to avoid the serial comma, the guideline now is to use it, but only where it’s needed for clarity. Virtual reality. Like autonomous technology, augmented reality has become a major fixture in modern society. When you refer to it now, the AP Stylebook says it’s fine to use VR on the second reference, as long as you spell out virtual reality the first time. What’s more, you may use AR to refer to augmented reality, on the second pass only, though. If you don’t write, or read, or interact with content of any kind, this might not seem like a big deal! To everyone in the content and online marketing communities, however, this is massive news. While online grammar has long since accepted these new realities, traditional grammar guidelines have seen them as “wrong” until very recently. Now that the recognition is formal, though, it frees online writers up from being looked down upon by grammar professionals across the web and print media. It also helps standardize digital content and ensure that it matches up with print media. Are the Stylebook and the Manual of Style Two Different Things? If you’re flashing back to a time when you had to map sentences in high school grammar, it’s okay. Grammar can be a confusing and often overwhelming topic, and wondering what the heck the difference between the Manual of Style and the AP Stylebook is doesn’t help matters. Here’s some clarity: they’re two separate entities. The fact that both entities agree on many of these changes means an enhanced sense of cohesion for writers everywhere! The recent changes on the part of the Chicago Manual do one thing: help unify online and print writing for the sake of journalists and copywriters everywhere. By syncing grammar rules with digital grammar style, they help reduce confusion and make good writing easier for everyone. The print version of the AP Stylebook will be available May 31, 2017. While this guide is updated annually, the Chicago Manual of Style is updated less frequently, and the last update was in 2010. Check back with both entities regularly to stay on top of future updates! Are you looking for a professional writer to help you create quality web content? Look no further than Express Writers, your source for award-winning content marketing material. Visit our Content Shop today! 2016: we found our roots. Seriously. We’re ending the year with some deep, high caliber roots in place, and I’m glad about it. In the level of expertise our staff members have today, a perfect content fit in each of their roles: in the quality and dedication of the writers we have, and the standards we’ve been growing to perfection all year. In 2016, we created the most content we ever have, not just for clients but for industry resource and learning materials. We worked hard all year: reinvented our editing standards in May, launched serious changes over November that improved our entire team, content quality, and clientele, and rounded up the year with some fabulous content. We launched our new #howtowrite learning category, launched an incredible Twitter Chat, #ContentWritingChat in January that made it to #4 on Twitter, and I was able to launch my book, self-published in April on Amazon and Barnes & Noble, and our Write Podcast published in March. Download the Report (PDF version). No way all this happened in one year, standing here and looking back. Yet it did. And, it’s actually short of the goals we had for 2016. Crazy, right? Let’s start with what the brunt of our workload looked like for the year, as content writers. 262,000,000+ words estimated written by our team in 2016! That’s roughly 524,000 500-word articles. Included in that word count besides articles and blogs: press releases, ebooks, ad copy, product descriptions, landing pages, web pages, slides, scripts, emails–to name a few. Our top content service sold for the year: blogs! Our top two expert writing categories in demand: legal and technical. Unprecedented grassroots success creating and running our Twitter Chat #ContentWritingChat, launched mid-January this year, managed by our fantastic Social Media Manager, Rachel. We see up to 1,000 tweets during the live hour now! Our Twitter chat was #42 trending on it’s first week back in January 19th, and by August, trending at #4. In November, we had our first sponsor! Launching the Write Podcast in April, making relationships with people like Sujan Patel, Steve Rayson, Mark Traphaghen, and many other fantastic content marketing influencers and leaders through it. Launching my book So You Think You Can Write? The Definitive Guide to Successful Writing (400+ copies sold, word-of-mouth only! ), in April, and seeing it hold strong in #4 bestseller category in Amazon for months. Writing and creating internal training for our writers, with a custom 101 library of more than ten individual resources just for them, tailored to the weak points we saw that kept cropping up. Getting personal notes of thanks, and seeing tangible proof in their improved writing skills to show us the mentoring helps, is seriously rewarding. Launching the How to Write category with over 15 up-to-date guides published late 2016, teaching all things online content writing. Launching my book, podcast, and Twitter chat, and seeing amazing successes between them all, especially in our live hour with #ContentWritingChat. Getting our biggest client ever, and being able to write their orders with liberty (very few strict guidelines, a lot of creative freedom – dream client). Having the honor of hiring Tara Clapper, the former blog editor at SEMrush, an all-around content marketing guru that I’ve been talking to online for years. Training and guiding a successful editing team to work with our writers and help guide them to their best skills. Visiting the SEJ Summit in NYC with my team members Tara, Krystal, and Josh. Despite a lot of rough patches this year in the customer-facing support team with other representatives, this November I was able to reach out to and re-hire my sales manager Tamila McDonald, who worked with us in sales and content management all the way back in 2013 (and was fantastic at it). She’s been fantastic in the role already, helping our customers achieve success with content needs. Straight from the heart: thanks to all of you who have helped us grow this year! We value each and every one of you. There were crazy things to deal with in the support staff this year, but they weren’t anything that a successful company hasn’t experienced at some point or other (non-loyal staff). We appreciate you so much, and will continue to work hard to earn your business and create the best content money can buy. Let’s start by looking at what our most-shared pieces consisted of as a whole in terms of format and content type, then, delve into the top posts themselves. Now, it’s time for a look back at our ten top performing posts of the year. (See blog here) Everyone loves a little New Year’s cleaning, and this post was our top performer because it helped people understand exactly what a content audit is, and why it’s so important to conduct them on a regular basis. In addition to clearing out any icky, old content that’s hurting your SEO, a good content audit gives you the chance to comb through your content and find any material that is outdated, inaccurate, or not converting well. In our content audit post, we showed readers how to use platforms like the SEMrush Site Audit Tool, Moz templates, BuzzSumo, and WordTracker to perform expert-quality content audits in preparation for the new year. The post earned more than 1.5K shares and remains one of our most popular pieces! (See podcast episode here) Episode 6 of The Write Podcast remains one of my favorites, and it was one of our readers’ favorites, as well. In this post, I interviewed Sujan Patel, co-founder of Narrow.io and Content Marketer.io, about everything from entrepreneurship to becoming an all-star guest blogger. Sujan and I talked about how he develops his tools (and why it’s so important for him only to work on projects he feels emotionally invested in). We discussed his relation to Neil Patel, (they’re cousins!) and how he feels about live-streaming. He also offers some advice on testing business plan ideas and taking risks to get to where you want to be. If you’re starting a small business or working to build your online presence, you’ll love Sujan’s declaration that a single payment may not matter as much as the relationships you’re building with your clients. This episode earned more than 1,000 shares with our followers! (See predictions post here) Now that the year is over, this post shines brightly. Published December 31 of 2015, we talked to 19 content marketing experts to put this post together. Each of them had a different prediction for the future of content marketing in 2016 and, guess what? Many of them have come true! Steve Rayson, the Director of BuzzSumo, told us 2016 would be all about developing clear outreach strategies and connecting with influencers. This couldn’t be more true: leveraging the power of a real relationship with influencers works! Example: when I connected with Sujan Patel, a major entrepreneur and content marketer, I was able to get his name on my book (he wrote the foreword) and record a podcast episode with him. The episode turned out to be our most shared one! Michael A. Stelzner, the founder of Social Media Examiner, told us that 360-degree live video streaming would explode. Live video has been all over the web, and talked about all year, from Facebook Live to Snapchat, Instagram Stories and more. Finally, Director of Marketing at Stone Temple Consulting Mark Traphagen predicted that 2016 would be a year of “quality over quantity” – we couldn’t agree more! Quality has been reigning high all year long. This post earned 446 shares last year. Now, we’re excited to look forward and make some new predictions for 2017! (See post here) This was one of our most exciting posts of 2016. It broke down Google’s newly released Search Quality Evaluator Guidelines. The Guidelines, developed by Google to train its human search quality evaluators, provided a wealth of information about everything from the requirements for quality web content to the importance of expert writing. The guidelines also dove into mobile optimization, page design, supplementary content, misspelled queries, keywords, and more. The one-stop-shop for anyone who wanted to know what the lengthy guidelines said about content, this post was one of our favorites to write and one of the most useful for our readers. As such, it earned 295 shares on social media! (See blog here) Long-form content was a buzzed-about topic this year, and we took it on in this post. To start the post, we talked about how people who aren’t seeing the desired ROI from their content might be making one critical mistake: the content they’re writing isn’t long or thorough enough. Next, we broke down what long-form content is, and why it matters for readers and search engines. We talked about how long-form content tends to be evergreen, detailed, and informative, and how much that means to readers. We also discussed how blogs with 1,500 words or more rank higher, keep readers on pages longer, and boost conversions. To wrap it all up, we offered a few tips about tools to use for creating long-form blogs (SEMrush and BuzzSumo). This blog earned us 292 shares across the web! (See post here) This post was a shout-out to our small business clients and readers! Developing a content strategy for a small business can be tough – especially when funds and resources are tight. In this post, we offered a step-by-step process for developing a small business content strategy and maintaining it. First, we defined “content,” and then laid out the five types of key content that every small business needs (a blog, a web page, keywords, social media, and a buyer persona). From there, we provided a list of smart, actionable tips to build your content strategy, including defining your objective and creating a content calendar. Ideal for any small business struggling with content implementation, this was one of our highest performing posts of the year with 277 shares! (See post here) If we’re being honest, 2016 featured a lot of words like “innovative,” “stunning,” and “unique.” While there’s nothing wrong with those words, they’re a little boring, and we can’t help but think there are some oldies but goodies stagnating in dictionaries. To celebrate those words, we wrote this post. Grumpish: Meaning sullen or grumpy. Example: The content marketer got grumpish when he forgot to complete his content calendar for the month. Apricity: The wonderful feeling you get when it’s cold and wintery out, but the sun is shining warmly on your back. Curglaff: A giggle-inducing word meaning shock or surprise. This post was great fun to write, and it earned 242 shares once we pushed it out to readers! Buffer: A social media management tool that allows you to schedule posts to up to 15 different social media profiles from one dashboard. Canva: A simple DIY graphic design tool that you can use to create blog headers, social graphics, and more. SproutSocial: Another social media management tool, and the host of #SproutChat on Twitter. GoogleWeb Designer: A banner creation service that lets you design and build banners for your websites. SEMrush: A keyword tracking tool that allows you to research topics, find influencers, and recognize trending content. AngelList: An investment platform that helps you raise money for your various content marketing projects. MailChimp: An email marketing tool that allows you to automate campaigns and build templates. Wordtracker: A keyword research tool that can connect with you with some of the top-performing keywords in just minutes. BuzzSumo: One of our favorite tools, and the best way to find out what’s trending in the world of content. This post, with its big old list of tools earned us 241 shares across the web. (See infographic here) This infographic was a ton of fun to create, and it’s one of our favorite pieces of content from the year. Here at Express Writers, we love our copywriters, and this unique little piece gives readers a glimpse into the daily life of the people behind the content. In the post, we offer some general statistics about content (2 million blog posts are published daily, and the web hosts more than 900,000,000 websites, for example). From there, we go on to talk about who copywriters are – from stay-at-home moms to millennials – and how their left and right brain hemispheres work together to combine practicality and creativity. To finish the infographic off, we lay out five key copywriting techniques! This post raked in 235 shares across our various social channels. (See infographic here) Last but not least is this piece, “Your Infographic Guide to Online Content Word Counts.” Another infographic, this post details how long all of your content should be. It discusses Twitter’s character limit increase, and the best practices for Twitter post length (100 characters is the sweet spot). It talks about Facebook, and how perfect Facebook posts are 40-characters or fewer. It also breaks down Google+ lengths and LinkedIn content lengths. This helpful post earned 233 shares across the web! Here’s to 2017, creating more fabulously great content, and all that the New Year has in store! 24 HOURS ONLY: Go visit the Content Shop and use code cybermonday15 for $15 off $100 or more. Need help choosing the right content for you? Talk to us here! Happy Shopping!